Talking about the Aztec zodiac, one of my friends pointed for me the old Egyptian zodiac found in the dandara temple. I thought it would be a shame not to know about it. Then I remembered seeing a picture of it hanged on the wall in Serafis. It is very interesting! Here is some basic info: The Temple is located about 4KM from the River Nile, on its west bank, roughly opposite the city of Qena…… the western ceiling shows a perfect representation of the zodiac signs, which is one of the reasons that the Temple is so famous (the original zodiac relief is now in the Louvre museum in Paris, France). The 12 figures of the ram, the bull, the heavenly twins, the crab, the lion, the virgin, the scales, the scorpion, the archer, the goat, the watering pots and fishes with glittering tails. 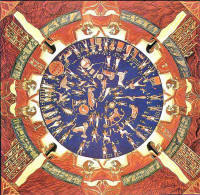 Also, The round zodiac ceiling shows the whole sky as it was understood by both Greek and Egyptian cultures. It shows the familiar constellations associated with the Greek astrological signs along with a number of other figures. They are carved on a disk that is supported by the goddesses of the four cardinal points and eight falcon-headed gods……. Insha allah when (or if) I go to the Louvre again, I would definitely look for that one. I was so surprised to see our zodiac signs (Leo, Gemini, Tauraus, Aries,,,) in this!! It was not just an illustration, I found a research paper (can’t remember the address but will find it again) studying every part, calculating it by the centimeter and mirroring it to our modern knowledge of astronomy, amazing. This entry was posted in Egypt, History. Bookmark the permalink.